ItemC-09251 - "Winter scene, Nome Alaska, '05-'06." 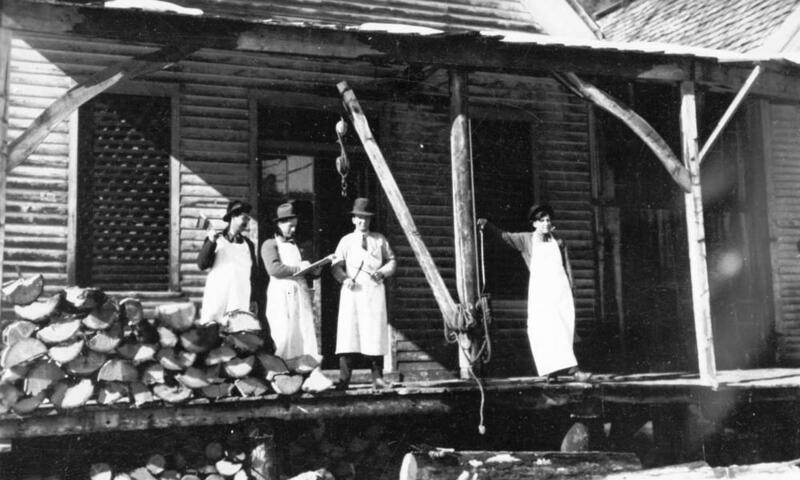 ItemC-09253 - "Pioneer Mining Co.'s cump on Little Creek, Nome, Alaska, April 22, 1906." ItemC-09277 - Quamichan First Nations village, east coast of Vancouver Island. ItemC-09304 - Chinese funeral in Barkerville. ItemC-09317 - Miss Campbell beside the Castello wheel at Stanley, BC. ItemC-09320 - "SS Comox, early passenger vessel at Bown Island (1893). Vancouver's Mayor Fred Cope standing on left of group." ItemC-09560 - First Nations canoe. ItemC-09383 - Woodside Farm, Sooke BC; Glinz family.